There are a special pair of pants I pull on when working around the yard. They’re made of a quick-drying fabric and have lots of pockets for all my crap, but that’s not what makes them special. The great attribute these pants have is something I added: a heavy coating of permethrin spray that literally stops ticks in their tracks. Yes, ticks freak me out. This time of year, I try to avoid areas likely to be infested and obsessively check myself after working outdoors. Even after all that, it may not matter: I’m convinced that the tick who gets me will leap off one of the dogs and onto me as I sleep. Now there’s another risk, one that in some ways is worse than Lyme disease: a tick-born sugar molecule called alpha-gal that may cause you to become allergic to red meat. Right. Not a virus, not a bacteria, but a sugar molecule. And it makes your body revolt against itself. The carrier is the lone star tick, a variety that’s been working its way north and in recent years started showing up in New York. I’d heard of the tick and this alarming condition before, but it was this episode of Radiolab on public radio really got me worried. Someday they’ll figure out a way to get this tick thing under control. Until then just spray and pray and hope the ticks don’t get you. How ironic that in a world of big risks, something so tiny may be our undoing. Wednesday was the perfect day for a visit to Thacher Park, but not if you wanted to walk along the Indiian Ladder trail. The trail is closed and it’s not clear when — or if — it will reopen. The family has retained an attorney, who has filed a lawsuit alleging negligence on the part of state parks officials and seeking undisclosed damages. OK. I’m not a lawyer and I don’t know all that much about cliffs and such, but I’m struggling to understand the negligence part. I’ve been on that trail more than I can remember, and there wasn’t a single time when I didn’t think of what would happen if boulders started tumbling down. I’ve stood under huge outcroppings of rock on the trail and pondered being squished. All this rock will fall some day. Hope I’m not the one standing here when it happens. Did the park officials know rocks might fall? I don’t know, but anyone who’s ever been there can see there are huge boulders scattered around near the trail. They didn’t get there by rolling up the hill. Now, in other parts of the park, I’ve seen where huge trees came down across trails. Fortunately, they haven’t hit anyone. I can’t say whether they made a sound, but I can say this: outdoor activities involve risk, even in a tame place like Thacher Park, bad things can happen. I don’t know what we expect the park to do, send teams of climbers up and down the cliff looking for boulders that might break free? Is that even possible to detect? Then we can have teams that roam the woods looking for dangerous trees. And of course, there will be dozens of signs warning people that the trails may be dangerous. 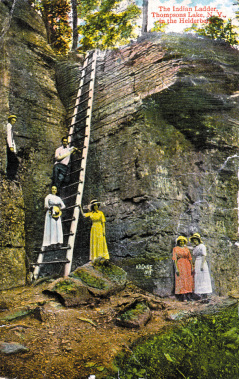 Or maybe something else will happen: they’ll shut down the Indian Ladder trail forever, and that would be a damn shame. It’s been a long time since a parking attendant has been seen at Thacher Park — and I reckon you’ll never see one again. It’s not because they won’t charge you for parking, but because of these kiosks springing up in the lots. The parking stations provide a convenient way for the state to collect your $6 “vehicle entrance fee” without actually providing the service rendered by a human attendant. 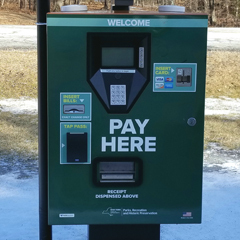 The park told WNYT that the fees help pay for maintenance and for park employees. That’s interesting, because without the pool and parking attendants, they probably employee fewer people than ever before. As for maintenance, I’m all for that. In recent years, it’s not been uncommon at Thacher Park to find broken picnic tables, busted grills, and trails in need of attention. I love Thacher Park and I’ll gladly pay to use it, but the cranky old man in me requires that I ask the following: “What about all that tax money we pay?” And my cranky old man does have a point. And by the way have you been to the new visitor center? It’s pretty cool — and I hope that in coming years we see as much attention to the little things in Thacher Park as we’ve seen to the big things. A picnic table may not have the governor’s name on it, but that doesn’t mean it’s not important. Plenty of talk about the Albany County Rail Trail on social media recently. On Facebook, a group called Bethlehem Resident News claims that thieves are using the trail as an express lane into Delmar from Albany. There have been a rash of car break-ins, so according to them, the perpetrators must be from Albany. They call the path the “Ho Chi Min Trail,” but I don’t think they’re suggesting it’s the Vietcong breaking into cars, do you? No, they’re saying it’s blacks from the South End. Over on Twitter, there was a lively argument over whether these rail trails should remain unpaved green space, instead of developed into slick super highways for speeding bicyclists. There may be something to that. If you’ve been on the paved section between Albany and Slingerlands, you know how fast people ride. I made the mistake of running on the trail a few times, very early in the morning, and had to dodge careless cyclists who were ignorant of the common courtesies of sharing a trail with pedestrians. The extreme end of the trail is in Voorheesville where I live. I’ve been running on the rough, unpaved surface recently, early in the morning when my only company have been deer. There are puddles and ruts, but I hope it’s never paved over. Let’s not forget that bicycles are vehicles and they’re going to be on these trails they should travel at a reasonable speed — and if that means we don’t pave the paths, so be it. Just off Johnston Road in Guilderland, you can see where beaver have been working on a couple of substantial trees along the Normanskill. Many people are saying it’s part of a plot to cut off Voorheesville from the rest of the Capital Region. One never knows. I don’t have to remind you that America’s largest rodent casts a long shadow here in ye olde Beverwijck. Christ, they named the place after the beaver. Albany’s seal shows a beaver felling a tree as a white man and Indian look on, presumably saying, “WTF is up with these beavers?” Stranger yet, is the coat of arms of the Albany Diocese, which shows a beaver holding a bishop’s staff. Bishop Beaver, I presume? Meanwhile, I’m interested in seeing how long it takes for those trees to come down. The beaver may have their revenge, yet. I’ve been on a few hikes lately exploring the trails in the north section of Thacher Park. Over the weekend we took the dogs and set off for the much discussed scenic overlook of Hang Glider Cliff. The girls take in the view. From the edge you see Altamont and the fairgrounds, apple orchards, dozens of water towers and the distant Green Mountains and Adirondacks. The absence of any railings make it more interesting, as well. As we were heading away, several vehicles came down the narrow path. Yes, the hang gliders were arriving at Hang Glider Cliff. The long list of chores at home would have to wait. Hang gliders are a friendly bunch who love to chat about their flying. As they set up their gear, they explained the ins and outs of the sport. Nobody goes off the edge on a whim. Among the group were two men taking their first flights from a cliff, only after many hours of training to prepare them for the real thing. Waiting for the wind to pick up. After some waiting for the wind to pick up, it was time to fly. Pretty cool — not just for the spectacle of seeing these guys fly from the cliff, but also because of the great spirit and enthusiasm the flyers have for gliding. Take a walk up the trail and maybe you’ll get to see them soaring. Like a lot of things, it depends on which way the wind is blowing. After running through a winter of pitch black mornings, there’s now a bit of color in the sky by the time I finish. The winter is not just dark, but silent — so the sound of a bird singing at 5:25 AM was surprising. It was just a single voice in the trees, and hopefully a sign of the seasons– not just a robin caught up in a moment of irrational exuberance. The dawn chorus is still weeks away, but we have heard a soloist. Lost might be overstating it, but it makes a much better headline than misdirected or mildly confused, wouldn’t you say? Anyhow, I woke up on New Year’s Day in a strange house on the edge of Mother Myrick Mountain near Manchester. Our family ski vacation was a bust thanks to the lack of snow, but we turned it into a perfectly fine playing board games and drinking vacation. So, the dogs and I greeted 2016 with a walk up the path behind the house. It led to a well travelled trail up the mountain, and the gradual climb was the perfect antidote for my throbbing head. We three went along until the human in the group had enough. It’s not clear when things started looking unfamiliar, but somewhere on the way down it was obvious that we’d missed our turn. Rob, where the f**k are we? We walked and walked, and eventually emerged from the woods, at a point on the road some three miles from the house. At worse this was an inconvenience. There are few places in the northeast where you can really get lost these days. Keep going and you’ll come to a road, and if you’re luck you’ll turn right instead of left when you get to that road. Then , perhaps, you’ll have a half mile walk home, instead of a three mile walk. Oh, well. Saturday was supposed to be about raking leaves until my son called early in the morning. He said he was coming home with a deer. It was already dressed, he said, which momentarily summoned up funny images of a buck in a flannel shirt, but I’ve lived upstate long enough to know what dressed means. He lives in an apartment, so there really isn’t a good way to skin and butcher a deer, so my house was the deer destination. I cleared out a space in the garage and screwed a big hook in the ceiling so the poor devil could be hoisted up by his horns. I’ll spare you the details. but by mid-afternoon, my son and his girlfriend were vacuum sealing freshly cut venison on the kitchen counter. My wife does not appreciate hunting, and she would certainly not like having a dead deer hanging in the garage. She was spared his earthy spectacle because she was gone for the day, off baking cookies with my sister in Poughkeepsie. But fate’s a funny thing isn’t it? Less that 12 hours later she called to say she’d hit a deer — a very big deer — not far from our house. She was fine, the car was a mess and the deer was MIA, having stumbled off into the woods. Before the tow truck arrived, I took a picture of the damage and wondered if the deer community would share pictures of wrecked vehicles the way hunters show off their prizes.